Well-known for their showy necks, giraffes have little knobs and bumps on their heads that are made of bone. These horn-like structures are called ossicones. While all giraffes have them, they aren't all the same; some species have more than two or have bumps in the center of their faces in addition to the "horns." Ossicones are about 5 inches long on most adult giraffes. They start out as stiff cartilage which goes through an ossification process as the giraffe ages. This turns the cartilage into bone and fuses it to the giraffe's skull. The ossicones are covered by skin and hair, just like the rest of the giraffe's head. When a giraffe is born, he has little bumps on his head that will eventually become his ossicones. These bumps are full of cartilage that isn't attached to his skull. The bumps start to grow and ossify, beginning at the tip and hardening down toward the base of the horns. By the time females are about 4 years old and males are 7, their horns are fully grown, turned into bone and firmly attached. Horns are the most common type of ossicone, but some giraffes develop other bony growths on their faces. These are knobby; they are shorter in height than the horns, but often longer and more irregular in shape. These knobs also start as cartilage and harden into bone. In males, these knobs are usually larger than in females, sometimes looking like another horn. In addition to knobs, males sometimes develop a nearly solid layer of cartilage that ossifies as they mature, making their heads heavier than those of females. All giraffes have skin and hair on their ossicones, but it's usually only the females who keep the hair. 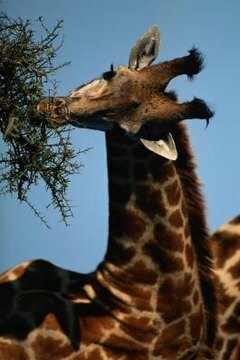 Ossicones develop tufts of hair on the ends that stand up, and are visible on females and young male giraffes. As the males mature, they use their heads and necks as weapons to earn female affection, swinging their heads powerfully into the necks of other male giraffes and butting heads. All this fighting action tends to wear the hair tufts off the ossicones of male giraffes.